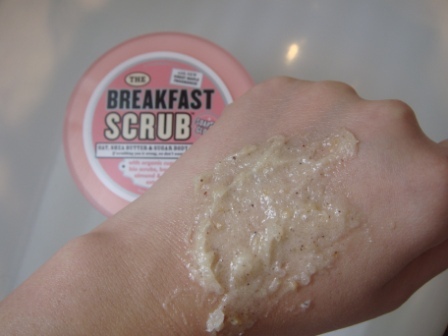 Soap & Glory's The Breakfast Scrub Body Exfoliator has been sitting in my "to try" box for a couple of months now. 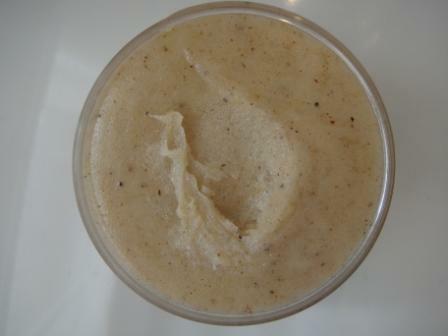 It's packed with skin loving ingredients including oats, shea butter, banana, almond oil and honey. I guess that I was mainly put off trying it sooner as the description, stating that it includes oats, made me expect this to be a lumpy, messy scrub. The packaging stays true to Soap & Glory's much imitated signature style. Although I tend not to like tub formats, the scrub is so thick that I can't think of any other way they'd feasibly be able to present it. I like that the packaging has been kept to a minimum. As a child of the '80s, I appreciate the fun name and it's a very cleverly thought out concept- a blend of breakfast ingredients to leave your skin smoothie soft. If you don't like maple syrup, you won't like this as the sweet, earthy scent hits you as soon as you open the tub. Luckily, I love it although I wouldn't necessarily want to be smelling the breakfast condiment all day long (it'd make me hungry for one thing!) so I was pleased to note that it didn't linger on my skin after my shower. As aforementioned, the scrub is thick, almost balm like in texture although as it doesn't melt into skin, I applied it to shower-damp skin rather than directly onto dry. A little goes a long way and the mix of sugar and salt granules make this a very effective "scrubby" exfoliant. My skin was left feeling soft and smoothed, although I still needed to moisturise. 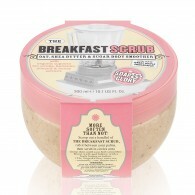 I really like The Breakfast Scrub- yet again, Soap & Glory have come up trumps! At £9.45 for 300ml, Soap & Glory have better value for money body scrub options (Sugar Crush is £9 for a whopping 450ml), however, I still feel that this is very reasonably priced and given that it's going to last & last, it's easily justifiable. I love this too, going to buy it again when the weather gets colder as it reminds me of porridge!